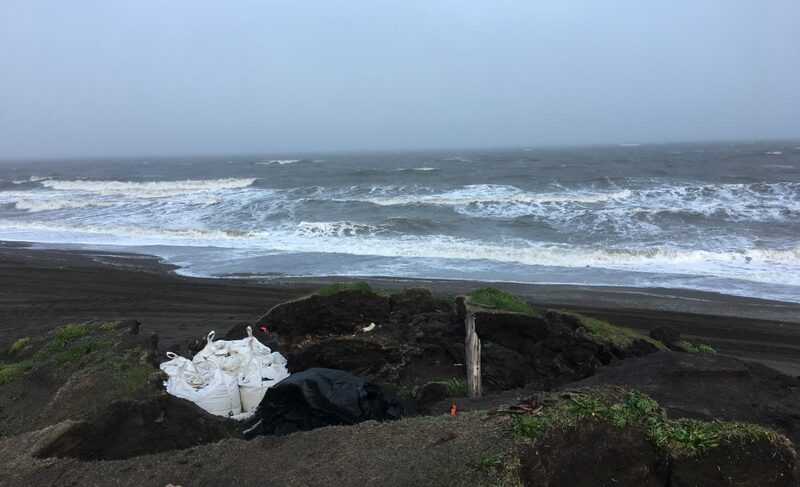 It’s been a busy week, between preparations for the Walakpa field season, an interesting polar bear that a local resident found eroded onto the beach, and other projects at work. Getting ready for the Walakpa project involves a lot of moving parts. We’ve got to get the lab ready to handle material coming from the field, get the logistics worked out, get field equipment ready to go, get all the permits and paperwork taken care of, and I’ve got to get my own personal gear set as well. We have been moving Nuvuk shovel test pit materials from the artifact cabinets in the lab to museum storage boxes, to make space in the lab for Walakpa materials. We will have a small lab crew this summer, and hope to have a conservator come up for a few weeks later in the year (he’s busy during the summer with his job). One of the lab sinks had no hot water, and it turned out that the valve was in the ceiling and several shelves needed to be moved. Dakota and Devin asked if they could move some other furniture, I said yes, and they really reorganized the space. I think it may wind up being more effective, and it let them get the shelves with the electronics set up and further away from the sinks. Dakota is inventorying our supplies of vials and canisters for storing small delicate artifacts, and in the process he has been able to rationalize their storage a bit. I’ll be making an order for Ziplock bags large and small, along with a number of other field supplies. The Sharpies are here already! While moving the lab around, we were also able to test all of our handheld radios, and figure out which ones need new battery packs. I’ve ordered them, and hope they make it before the field season starts. I’ve got the transit batteries tested, and am sending most of them out to Anchorage to be recelled, since they aren’t holding a charge as well as they should, and being outside won’t help. Hopefully the logistics folks will be able to check the tents and such, and we can repair or replace whatever needs it. IHLC is going to contribute to the effort by letting us use field equipment that they bought a few years ago with ECHO grant money. That will help a lot with sleeping tents &sleeping bags for those who don’t have them, as well as with kitchen gear for a sizable group. I went over a draft safety plan with UIC Science’s HSET person, and she sent me a fairly generic draft which I commented on. It will get revised, this week I hope. We’ve also had discussions about bear safety/ firearms safety (sort of related topics). We are also trying to see if anyone in town is selling bear spray (AC doesn’t) or if we can ship it in. I’ve sent around a draft emergency contact form and asked the folks who bring students to the field if they had any additions. So far, Ben Fitzhugh has had some suggestions. I’ll give folks a couple of days, and then send around the revised version. Meanwhile, I’ve been ordering stuff I need, like waterproofer for down gear, and a new Helly Hansen Jarvik jacket (I finally blew the cuff tighteners out of my old one last year). I’ve got to put up my tent and check the waterproofing, etc., although it was fine the last time I used it. I also sprang for an InReach. We should have one from UIC Science as well, but redundancy in emergency communication devices is a very good thing, and it will let me post short updates. And of course, I’ve got to get ready in other ways. I’m scheduled to renew my First Aid/CPR (for something like the 45th time) later this week. And I am working out, since a winter of lots of writing is not conducive to staying in the best of shape, particularly when fighting off bronchitis for a month. As our HSET Director said in a memo this week, when talking about his commitment to using handrails all the time, “my mind keeps writing checks that my body can’t cash,” and I’m trying to change that equation. Sending energy, resilience, and a continued sense of humor. You are a real work-horse!